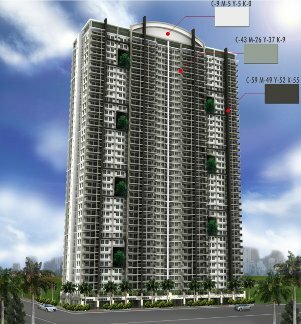 Flair Towers DMCI Mandaluyong is a two-tower high rise residential condominium project of DMCI Homes, along Reliance corner Pines St. near EDSA, Mandaluyong City, Metro Manila, Philippines. The twin towers of Flair Towers DMCI Mandaluyong will feature the Lumiventte technology, a breakthrough system by DMCI Homes that is built to maximize natural light and airflow into every unit any time of the day. Target buyers of the Flair Towers DMCI Mandaluyong are the young start-up families who would want to grow in a space they can truly call home, an ideal environment to nurture the family, now and for years to come. It will also cater to upwardly-mobile young professionals (yuppies) looking for independence who desire a comfordable, high-quality, secure and peaceful home environment within the city. Because of its proximity to EDSA and is only a walking distance to MRT Boni station, Flair Towers DMCI Mandaluyong will appeal also to the highly motivated, career-driven people of modest income, working in the Makati and Ortigas Central Business Districts, who aspire to live comfortably near their place of work, of study and of leisure. The country’s first Triple A builder / developer, DMCI Homes provides Filipino families with premium quality, urban-friendly and fully serviced communities. This is the DMCI home’s philosophy of smart living. With smart living you have a choice that makes no compromises about the quality of life. The project features a unique tower plan that optimizes natural light and ventilation into the living spaces. Balconies in all units provide homeowners their own quiet spot to enjoy their surroundings and the city views.